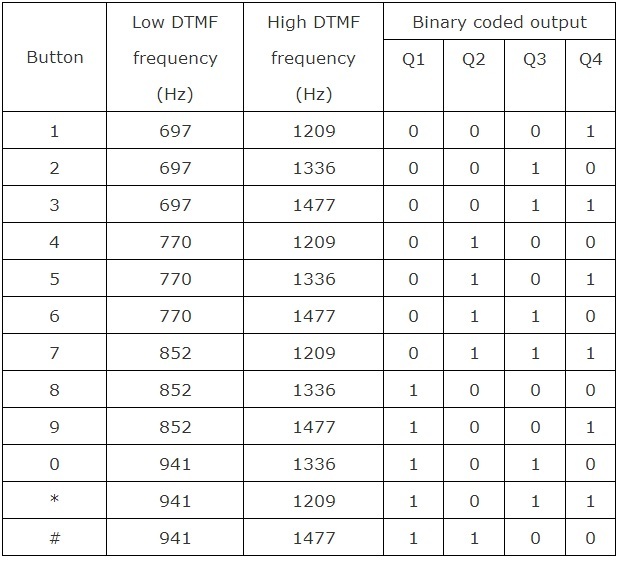 In this project, which based on DTMF decoder Ic M8870, we showing the output of M8870 ic in 7 segment. The 4 bit data output of M8870 ic further connected with LS7447 decoder which is BCD decoder to 7 segment display unit. Input tone from mobile gives to M8870 ic which further connected to BCD decoder LS7447 ic and then 7 segment. When we press any key from mobile (mobile keypad tone should be on) the tone goes to decoder ic which receiver certain key frequency and then converts to 4 bit data which further given to BCD decoder and then 7 segment connected to BCD decoder show that number which key pressed on mobile. It can remotely operate when someone calls to that mobile (which is connected to circuit) and remotely press any dial number which can be received and circuit can show dial pressed number of caller . The entire process from frequency detection to latching of the data, is controlled by steering control circuit consisting of St/GT, Est pins, resistor (390kΩ) and a capacitor (0.1µF). 5th Pin, INH is an active high pin, inhibits detection of A, B, C, D tones of character. 6th Pin, PWDN is an (active high), inhibits the working of oscillator thus stops the working of our circuit. The 10th pin 10; TOE is the output enable pin which is active high logic and enables the latching of the data on the data pins Q0, Q1, Q2, and Q3. 15th Pin StD is the Data valid pin, turn out to be high on detection of valid DTMF tone or else it remains low. Pins 7 (OS1) and 8 (OS2) are used to connect crystal oscillator. An oscillator of frequency 3.579545 MHz is used here.